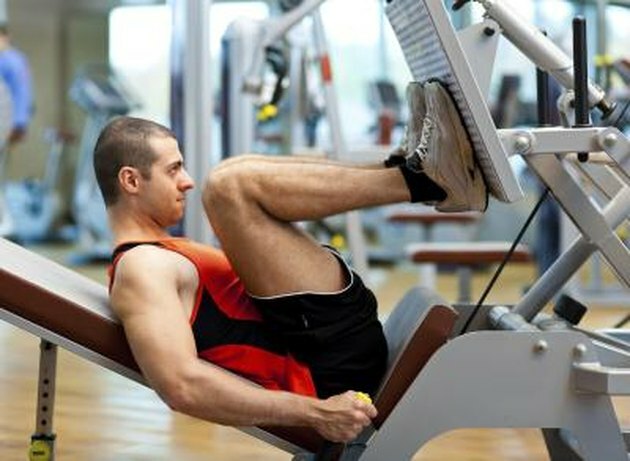 The seated leg press machine works many of the same muscles as the squat, without putting as much load on the spine and knees. You might include the leg press to isolate the quadriceps muscle group or to help ensure your body moves through a fluid and proper range of motion with load on the knee and hip joints. Always consult your doctor, however, before beginning this or any exercise regimen. The primary muscle group targeted by the seated leg press is the quadriceps at the front of the thighs. This four-headed muscle is responsible for the extension of the knee, which is what happens as you press the platform of the leg press machine with your legs. The largest of the buttock muscles, the gluteus maximus, assists the quadriceps during the leg press. You also get assistance from one of the largest inner thigh muscles, called the adductor magnus. The small flat calf muscle that lies deep within the lower leg, called the soleus, also assists as you press the weighted plate. Stabilizing muscles keep joints, in this case the knee and hip, in alignment as you do the exercise. During the leg press, the hamstrings at the back of the thighs and the largest calf muscle, the gastrocnemius, fulfill this role.